Steep mountainsides, Jackson Lake and the marshy Snake River valley provide obstructions that restrict hiking in Grand Teton National Park, so there are fewer trails than might be expected for an area this size. 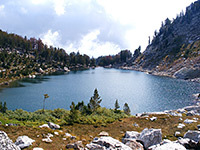 In particular, most of the northern half of the Teton Range, the section west of the lake, is inaccessible to all except determined cross-country hikers. Most of the day hikes are to smaller lakes, either close to park roads at the edge of the Snake River valley, or along the steep-sided canyons that cut into the mountains. Summits are in general accessible only to rock climbers though trails do pass close to a few (Albright Peak, Static Peak, Mount Hunt), and the tops of these mountains can be reached by a short off-trail scramble. Trailheads are listed from north to south, together with the places reachable. The most popular destinations are (in approximate order of increasing difficulty) Leigh Lake, Heron Pond/Swan Lake, Hidden Falls/Inspiration Point, Taggart Lake/Bradley Lake, String Lake, Cascade Canyon and Amphitheater Lake. The Grand Teton National Park map indicates the location of all trailheads. Colter Bay Colter Bay provides a pleasant setting for one of the three Grand Teton National Park visitor centers, as well as the start point for several easy trails that loop over flat, partly wooded land near the edge of Jackson Lake. Shortest is the Lakeshore Trail, which follows right beside the lake for a short distance then circles around an isolated, forested peninsula, passing a few secluded pebbly beaches. South of the visitor center, three interconnected paths lead to two marshy pools (Heron Pond and Swan Lake), which are likely places to spot wildlife such as beaver and moose; an extension (Hermitage Point Trail) loops around the edge of a larger and more remote promontory, past many fine viewpoints of the bays and islands at the south end of the lake. One further option, for a one way hike, is the Willow Flats Trail - a well used route across mostly open land of meadows, bushes and small streams, past Jackson Lake Lodge and ending at the parking area for Willow Flats Overlook. 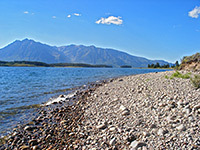 Two Ocean Lake Starting 1.2 miles northwest of Moran Junction, a 4 mile drive on partly unpaved roads leads to a picnic area at the east end of Two Ocean Lake, which is surrounded by gently sloping, wooded hillsides with higher mountains visible in most directions. The Two Ocean Lake Trail circles around the whole shoreline, while for a longer trip, the Emma Matilda Lake Trail leaves the loop at the far side, climbs quite steeply to a viewpoint, then heads further south through mixed woodland of pine and aspen towards the edge of an adjacent, similarly sized lake; from here it turns east, staying quite far above the water before eventually returning to the trailhead by the picnic area. Jackson Lake Lodge From the north side of Jackson Lake Lodge, a short interpretive path ascends gently up a treeless ridge to a minor summit (Lunch Tree Hill) overlooking the grasslands of Willow Flat, with Jackson Lake beyond and the Tetons rising up in the distance. A rather longer route heads east, across the main road and down to a junction beside Christian Creek; the right branch passes small but scenic Christian Pond, climbs over a partly wooded ridge to the southwest corner of Emma Matilda Lake and continues close to the shoreline to an alternative trailhead reached by a side road which meets US 26/287, 1.2 miles northwest of Moran Junction. Signal Mountain This trail climbs wooded slopes to viewpoints of the Teton Range and Jackson Hole, near the summit of a small hill (Signal Mountain) close to Jackson Lake - a location also reachable by a narrow, paved road. Leigh/String Lakes One of the most popular paths in Grand Teton National Park begins near Jenny Lake Lodge, next to small but pretty String Lake; it winds through pine forest along the shoreline and soon emerges at the edge of much larger Leigh Lake, which is also surrounded by trees on all sides apart from northwest, where the land slopes steeply upwards to 12,605 foot Mount Moran. The trail stays close to the lakeshore all the way to the north end, then crosses an short open area to a pair of smaller lakes (Bearpaw and Trapper) where the official route ends though hikers may continue a little way beyond, following an equally good path that follows a stream to Bearpaw Bay on Jackson Lake. Another option for a hike in this area is the complete loop around Jenny Lake, the north shore of which is reached by a five minute walk south from the lodge, though this is a relatively long trip that does not offer much change in scenery. Likewise, the shorter circuit of String Lake makes for an easy, mostly level hike taking not much more than an hour. A fourth path, for experienced hikers only, is the Paintbrush Canyon Trail. 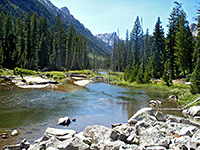 This begins at an intersection with the route to Leigh Lake; it crosses the outlet stream on a footbridge, rounds the wooded hillside far below Rockchuck Peak and enters the target canyon which is then followed past Holly Lake, just above the treeline, all the way to a mountain pass at 10,700 feet (Paintbrush Divide). The next section descends steeply to Lake Solitude at the upper end of Cascade Canyon, and eventually reaches the west edge of Jenny Lake. Cunningham Cabin This easy, interpretive trail takes hikers to a wooden cabin close to the Snake River - an old homestead constructed in 1890 by Pierce and Margaret Cunningham, settlers from New York. Jenny Lake The main Jenny Lake trailhead (and visitor center) is reached by a short side road leading to the southeast shore, and it provides an alternative start point for the 6.6 mile loop hike all around the edge. But the main destination for hikers hereabouts is U-shaped Cascade Canyon on the west side of the lake, reached either by a 2 mile hike along the southern section of the loop path, or by taking the Jenny Lake shuttle boat, which departs every 15 minutes during the day from May to September. Once at the far side of the lake, the first point of interest is Hidden Falls, a pretty, 100 foot whitewater cascade on the creek emerging out of the canyon. A side path climbs a little further to Inspiration Point, on a cliff high above the lake, from where the views extend all across Jackson Hole and the Snake River towards the distant Wind River Mountains. These two are the only places seen by most visitors since rather fewer people continue past the falls; the main trail soon levels out as it enters Cascade Canyon, where the wide but shallow creek flows through trees, meadows and marshland, good habitat for wildlife especially moose. The path stays fairly level for 4.5 miles until it reaches a fork in the canyon and splits. 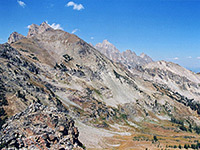 The right branch soon passes above the treeline and reaches Lake Solitude, then ascends much more steeply to Paintbrush Divide and eventually returns to the Leigh Lake Trailhead, while the left fork has a longer journey to Hurricane Pass on the national park boundary, next to Schoolroom Glacier; the path then begins a descent down the west side of the Tetons, entering the Caribou-Targhee National Forest. Lupine Meadows A short unpaved side road leads to the Lupine Meadows trailhead, by the edge of the forest 3 miles due east of Grand Teton. The one path heads south through thick woodland, level at first then ascending up a ridge to a junction with the Valley Trail from Bradley Lake (starting at the Taggart Lake trailhead). Continuing straight on, the path now climbs quite steeply via several long switchbacks across land that is partly open at first then more forested, becoming quite rocky around the 9,300 foot level, as granite boulders and small cliffs appear. The gradient lessens shortly before the trail passes Surprise Lake and ends at the edge of more scenic Amphitheater Lake, set in a granite bowl 2,000 feet beneath Disappointment Peak. Fainter paths leads north and south to viewpoints of the two adjacent valleys (Glacier Gulch and Garnet Canyon), and of other nearby peaks including Mount Owen. The lower end of Garnet Canyon can be seen close up by a separate trail that forks off the main route half way up the hillside. Taggart Lake Two scenic and quite easily reached lakes are the main destinations from the Taggart Lake trailhead, Bradley being the other, though paths also link with the adjacent trailheads to the north and south (Lupine Meadows and Death Canyon). Taggart Lake is the closest, and the trail to its south shore crosses a flat open area, climbs a glacial moraine alongside a small but fast flowing stream then descends to the water's edge through a belt of new growth woodland. The slightly longer path to Bradley Lake forks off northwards after 1.1 miles, ascending a partly forested ridge then leading down the far side to the shoreline. Another trail along the edge of Taggart allows for a loop hike to both lakes of 4.5 miles, round trip, while a continuation path joins the longer Amphitheater Lake Trail from Lupine Meadows. Menor's Ferry The very short Menor's Ferry Trail leads to an old cabin on the banks of the Snake River, beginning at the parking area for the Craig Thomas Discovery Center by Moose Junction. Interpretive notices give information about the history of the area - the cabin belonged to William Menor, who operated a ferry across the river, starting in the 1890s. Nearby is the Chapel of the Transfiguration, constructed in 1924. Death Canyon The Death Canyon trailhead is the main entry point into the southern section of the Teton Range, with several different paths leading into the mountains. RVs and trailers are not advised since the approach road is narrow, winding and unpaved. A 3.7 mile section of the Valley Trail follows the edge of the hills northwards to Taggart Lake, but the main route heads due west up a densely wooded hillside, soon arriving at an overlook of the deep blue waters of Phelps Lake. At a junction further downhill, one path descends a little more to the lake and (after two more intersections), traverses a hillside into the next ravine to the south (Open Canyon), which has treeless, rocky slopes on one side and thick forest on the other. The canyon is followed for a while before the route climbs steeply to Mount Hunt Divide then starts a long descent southwards into upper Granite Canyon. The second path from the junction enters the lengthy ravine that drains into Phelps Lake (Death Canyon), which is the most popular destination in the area. The trail passes through woodland and meadows, while climbing quite steeply at first then less so towards the upper end, and finally peaks at 9,600 foot Fox Creek Pass on the park boundary, where other routes branch off to the north, south and west. But for a day hike, one suitable target is the junction with the Alaska Basin Trail after 3.8 miles - in quite an open and scenic part of the canyon. This trail rises very steeply from the valley floor passing close to Albright Peak and reaching a highpoint of 10,800 feet at Static Peak Divide, before crossing the park boundary and descending into Alaska Basin. Granite Canyon The lightly used Granite Canyon trailhead is reached by the unpaved section of the Moose-Wilson Road, a route not recommended for RVs. At first the path is quite level, crossing grassland bordering Granite Creek, then it enters the forest and veers northwards into the lower end of Granite Canyon, which is then followed upstream for over 6 miles. En route are two junctions, with a trail up the Middle Fork of Granite Canyon and one from Open Canyon. 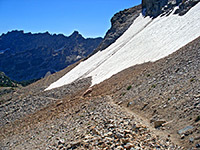 At the far end of the main canyon, the path reaches small Marion Lake then turns north towards Fox Creek Pass.